What Does Ivan See In Fosjoas Electric Skateboard K1? Last year, Moben Global Inc. had rolled out a type of intelligent self-balancing electric scooter, that is, K1. Ivan is a scooter-lover who also witnesses the announcement of FOSJOAS K1. 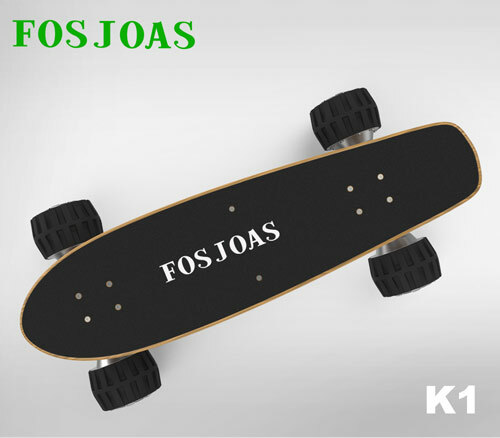 FOSJOAS K1 looks like the traditional skateboard, but in fact a great deal different from the traditional one in many facets. By virtue of its own features, it allures a great many scooter-lovers and skateboard-lovers, including Ivan, to buy it. It caused a big sensation in the market for scooter. See the great popularity; Ivan is eager to buy one set. Now Ivan has bought it and played with it for a week. He has a deep experience of riding FOSJOAS K1. Compared with the traditional skateboard, K1 is a type of electric scooter with wireless remote control. The wireless remote control skateboard K1 is available to control from a certain distance. Even if Ivan is 10 metres away from K1, Ivan is still able to control K1 via his remote control at hand. The wireless signal can penetrate the wall and any barrier. It makes possible to connect K1 freely and efficiently. Via the remote control device, Ivan can adjust the speed of K1 in the process of cycling and thereby he is fortunate to taste the variation of speed. The wireless remote control is a huge stride in FOSJOAS K1, which makes it stand out from those traditional skateboards. At first, Ivan is deeply impressed by the sophisticated tech introduced to FOSJOAS K1. Skateboard-lovers, for the most part, are the young like Ivan. They are young and energetic, craving for fashion and novelty. The traditional skateboard seems too boring and dreary, which dents the interest of the young. FOSJOAS discount electric skateboards K1 makes colourful stickers available. Ivan can choose their own colourful sticker on their precious K1. The stickers are full of colours, patterns and themes, sufficing to the variable needs of the young. That is why others around Ivan find his scooter new all the time.